Last week I reviewed the Franklin-Christoph 66 Stabilis fountain pen, which is one of FC's longer fountain pens that is meant to be used at your desk. This week, to stay in the theme of desk pens, we'll have a look at an accessory that will turn ANY pen into a desk pen! Desk pens used to be a common item found on office desks back in the days when everyone still, well...wrote with pens! Nowadays, computers have most likely taken over that real estate on most desks, and a lot pen manufacturers (however, not all of them!) stepped away from producing real desk pens. You can still find some here or there, but it'll most likely be one of those crappy Bic desk pens at the bank or postal office, gross. 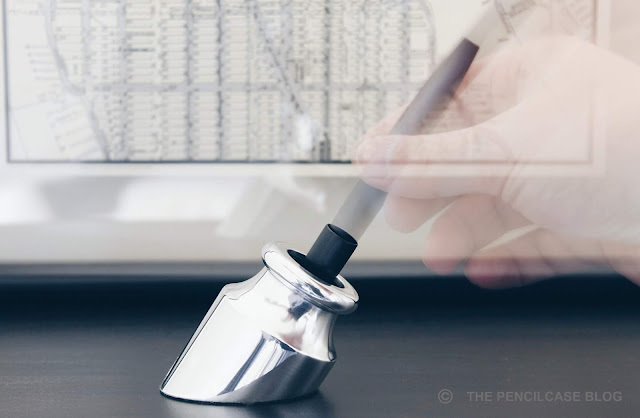 Good Made Better, a relatively new American brand, aims to bring back the heydays of the desk pen with their Penwell and Pen Stand. 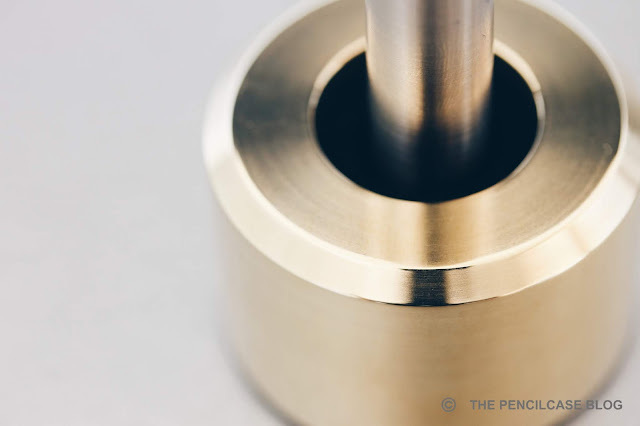 They sent an aluminium version of the Penwell and a brass Pen Stand over for review, so let's take a look at how they can brighten up your desk! There aren't many options on the market if you want to store and display your pens. Probably the most obvious and widely-known option comes from Dudek Modern Goods, with their Walnut Cube (or the similar Karas Pen Co. aluminium Cube, made in collaboration with Dudek). These chunky blocks of wood or metal can accommodate a couple pens, but don't offer much additional functionality besides holding them neatly in one place. In comparison, the Penwell is a small piece that looks a bit quirky at first. 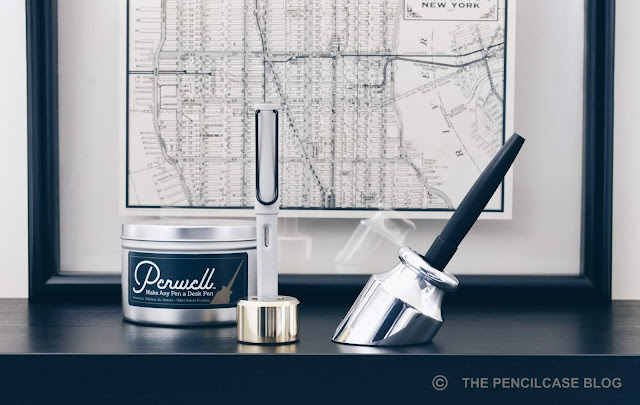 The major selling point of the Penwell is of course that -apart from storing your pen- it transforms ANY pen into a desk pen, making it possible to cap and uncap your pen single-handedly. It's available in a variety of materials, with walnut, brass and aluminium being the standard offerings. Other materials (such as acrylic, ebonite or ceramic) are occasionally available as limited editions. 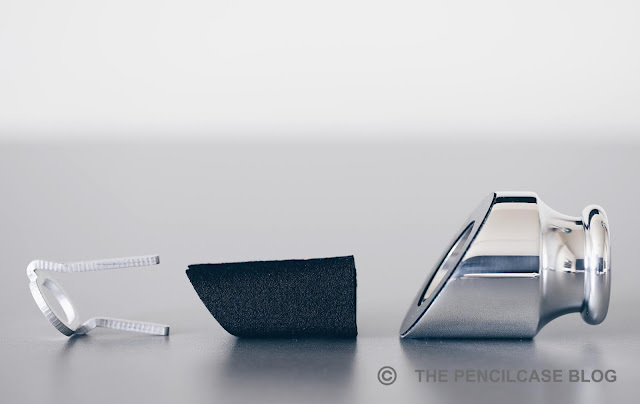 The Penwell doesn't take up much space on your desk (with a footprint of about 5x6 cm / 2"x2.75"), and looks more elegant and light compared to the Karas Pen Co. Cube (which, of course, holds more than one pen). Apart from the Penwell, GMB also offers the Pen Stand Model No.1: an even smaller desk accessory that -as the name suggests- displays a single pen. 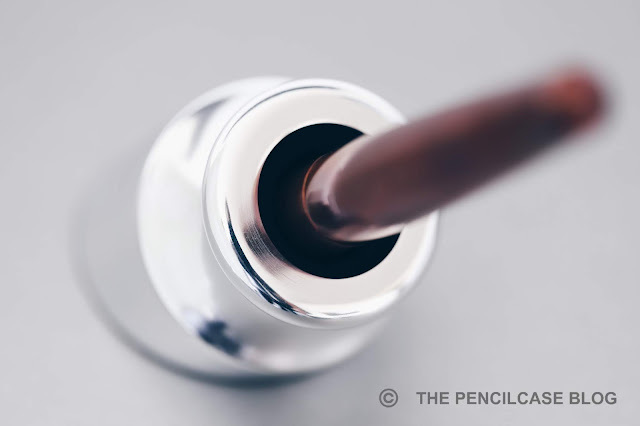 If you take a closer look at the Penwell, you can see that the way it works is actually quite simple: it stands at an angle to keep your pens pointed towards you, similar to a traditional desk pen. A metal clamp inside provides a secure fit, and a black foam tube prevents the clamp from damaging your pens. 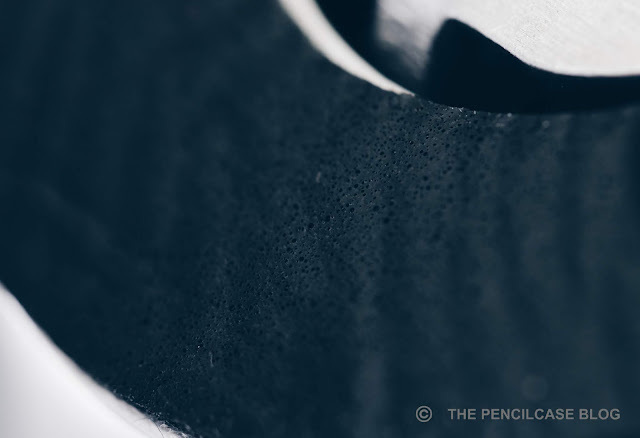 The bottom of the Penwell is covered in a special 'microsuction' adhesive tape. You can place it on any (relatively) smooth surface, and it will adhere due to the small bubbles in the material that act like tiny suction cups. 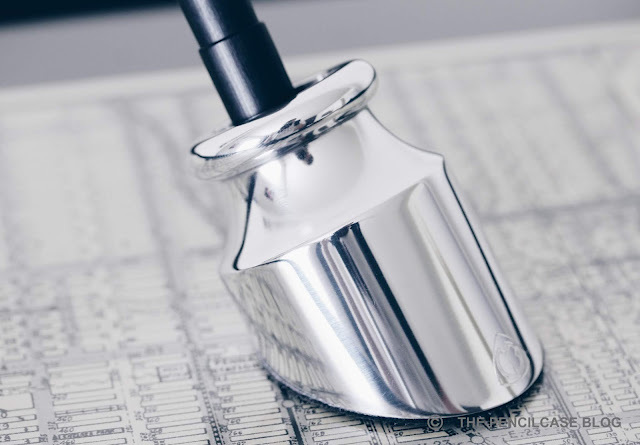 No actual adhesive is needed, so it doesn't leave a residue and you can re-use it (although you do have to clean it occasionally with a damp cloth to remove dust from the microsuction pad). I placed them on a wooden desk, and it adhered quite well, despite the surface not being entirely smooth. In practice, there are some pens that work very well, and others that don't. Some examples: Snap caps that aren't too strong will work (like the Lamy 2000), but I found I would occasionally pull out the entire pen when the cap wasn't inserted properly. It's excellent for twist caps, but only those with a short or moderately long thread. Some pens take two rotations or more to uncap, which makes the whole process a bit tedious. Both pens with or without clip can be used, but of course the clip adds to the diameter of the pen and creates a tighter fit. The metal clamp narrows down towards the bottom, so a good variety of pens will fit. You can also take it out and slightly squeeze it together to create a tighter fit. Additionally, a larger foam insert is available separately (for both the Penwell and Pen Stand). It takes a bit of experimenting to see which pens are best suited, but once you find a good combination, it becomes a useful tool on your desk. I often paired it up with the TWSBI Eco, which is one of my workhorse pens that I always like to keep inked up and ready to write. As a sidenote: Good Made Better has a Youtube channel where they post tips and tricks to improve the usage of the Penwell, which is definitely useful to watch if you're not sure which pens to use and how! Let's take a closer look at the Pen Stand (Model No. 1). It's quite a simple product that holds and displays your pen. It's nothing groundbreaking, but again the execution is quite on point. The Pen Stand has a straight cylindrical shape with a strongly beveled top edge. It's more minimal in looks, whereas the Penwell has a design with a slight vintage nod to it. 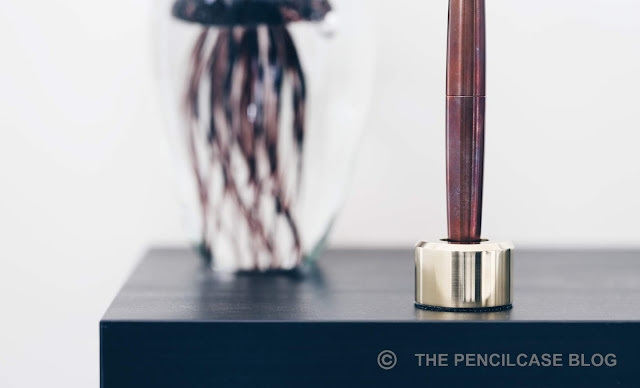 I quite like the sleek look of the Pen Stand, especially in this brass finish (also available in walnut). The same microsuction pads are used to affix the Pen Stand to your desk, and the foam insert hugs your pen. I especially like it to display minimal machined pens, it shows them off perfectly. As mentioned earlier, you can buy larger foam inserts separately.The foam inserts that come standard with both the Penwell and Pen Stand have a smaller inner diameter, which will hold your pens (especially narrower ones) a bit tighter and will make usage easier in some cases. The standard size accommodates pens between 1cm and 1.6cm (0.375"-0.625"), and the large goes from 1.3cm to 2cm (0.5"-0.75"). I requested the large foam inserts for both Penwell and Pen Stand (which are available separately), because I tend to use larger pens. Something I haven't touched on -build quality- is excellent on both the Penwell and Pen Stand. The aluminium and brass versions (I can't speak for the walnut version) are machined precisely with nicely rounded edges, and are polished to a shiny finish. 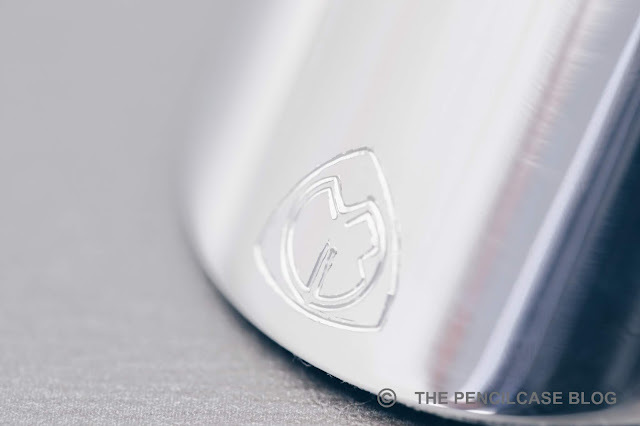 The GMB logo is engraved at the back of the Penwell. My only gripe I had with both the Penwell and Pen Stand is that the foam inserts are open at the bottom. Since I asked for the larger inserts, smaller pens would push all the way through the stand and hit your desk (ok, so maybe it's kind of my own fault!). If you plan on using 'normal' diameter pens, it's probably best to stick with the standard size foam inserts to provide a snug fit. The Good Made Better Penwell and Pen Stand are great desk accessories for those who don't want a bulky display with a lot of pens (like the Dudek Cube) on their desk. It's quite convenient if you're like me, and keep your pens stored in a leather pen case to take with you, but want just one pen on the desk for quick and easy access. Both products succeed at being simple but functional additions to your work environment, that make something trivial, like capping and uncapping your pen, easier. Prices start at 49$ for the Penwell and 29$ for the Pen Stand in walnut wood, and go up from there, depending on the material. Especially the Penwell isn't exactly cheap, but it's very well made and offers a functionality that is quite unique on the market. This product was sent to me by Good Made Better so I could write this review. I was in no way influenced in the making of this review, the opinions shared in this review are completely my own! This post does not contain affilate links.